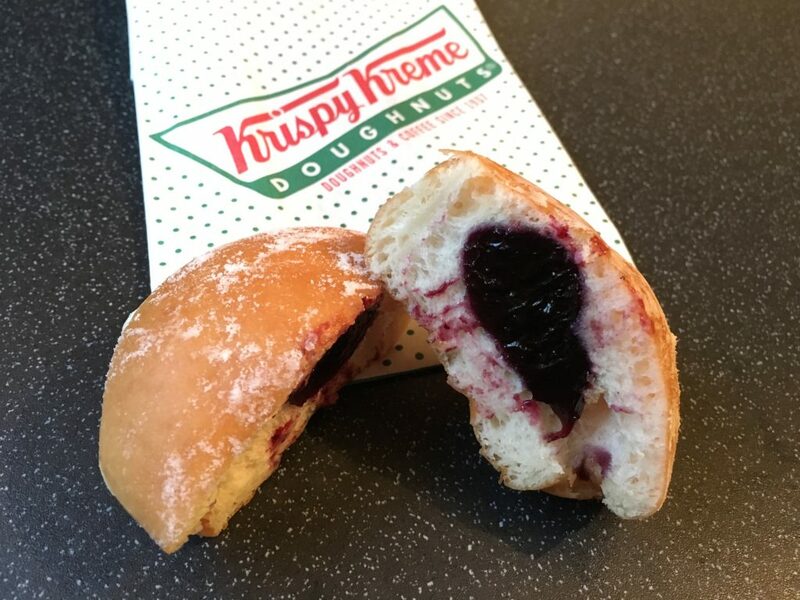 Today we have waved goodbye to the Krispy Kreme Vintage Glazed Kreme and said hello to the Krispy Kreme Vintage Powdered Blueberry. This blueberry number is the one that I voted for and naturally have been most excited about. I am not entirely sure why this has floated ones boat however I do love blueberry and it seems a little different to what we have seen doughnut wise lately. 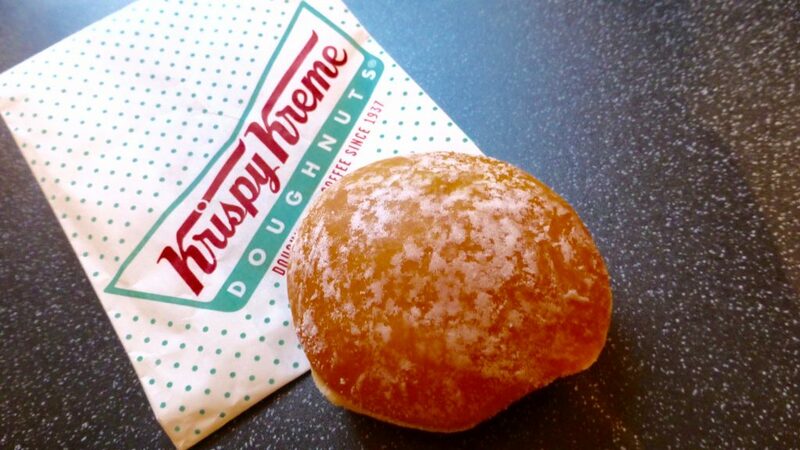 For anyone that doesn’t know the vintage range features 4 doughnuts – Glazed Kreme, Powdered Blueberry, Cruller and Pumpkin Spice and all formed part of Krispy Kreme’s UK launch back in 2003. This time around each of these 4 doughnuts are available for 2 weeks only over an 8 week period. The Krispy Kreme Vintage Powdered Blueberry is the second on the vintage cards. From first glance I really thought it was going to be more powdered than it was. I assumed it would be as white as a ghost however there seemed to be a distinct lack in the powder department. Cutting open I was more than pleasantly surprised by its jammy filling. The doughnut looked okay but a wee bit stodgy on the bottom layer. Taking a bite confirmed this wasn’t the lightest fluffiest doughnut that is what Krispy Kreme are famous for. It really didn’t have that signature I was looking for and just tasted like a regular below the belt doughnut. The blueberry filling however was most delightful. Unbelievably fruity, slightly sticky and thick like jam, and had a lovely blueberry flavour that was the right balance of sweetness and tartness. As much as I loved the filling it just didn’t go well with the doughnut. I don’t know if it would have aided better with a a glazed doughnut rather than a powdered one, but the dough just didn’t seem right, and the iconic Krispy Kremeness was lost. I do however want that blueberry filling in a jar to top my toast and muffins with! I must say I much preferred it to the Glazed Kreme so that is at least something. The Krispy Kreme Vintage Powdered Blueberry is available in stores and the cabinets from now until the 2nd October. Was so disappointed with this doughnut . Tasteless doughnut and the dust was non existent. The jam in my opinion was mehhh but think and jelly like. 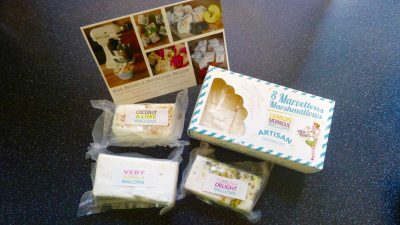 Really didn’t like the texture at all I would probably compare this to a supermarket effort. Sorry just not for me at all.